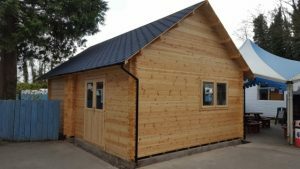 There are a number of factors that affect the height of a log cabin for example the size, the roof style, the door height and positions, the roof covering and insulation. Here are the heights of our standard Design Your Own Log Cabins. They are external heights to the apex and include the tanalised bearers, wall logs, roofboards, roof covering and felt fillet. In some cases we can try to reduce the height of log cabins over 2.5m high by offering lower doors, lower pitched roofs, heat on felt instead of etc. The options available and the heights that can be achieved depend on the size and style of the log cabin. In some cases it is not possible to reduce the height of the log cabin without compromising its design features and/or structural integrity. All measurements are based on technical drawings and may vary slightly in real life. If the measurements of the log cabin is important to your project please contact us for further information.